Hopefully Washington State can celebrate the passage of Referendum 71; preserving the domestic partnership bill that was passed in Olympia, but challenged at the ballot box. Looks like 71 is ahead, but more ballots are being counted as I write. Ballot box victories for gay rights may be somewhat rare, but not unprecedented. Usually human rights are extended by court or legislative action rather than popular vote, but Referendum 71 isn't a first. 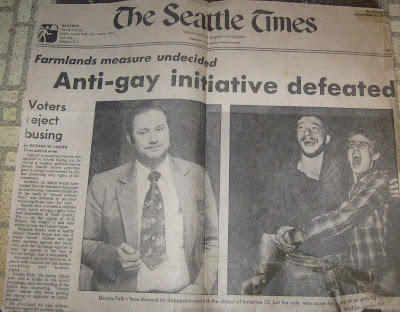 In 1978, Seattle voters rejected an initiative to repeal that city's non discrimination in housing and employment ordinance which had been extended by the city council to cover sexual minorities. Pictured above, November 8 1978 Seattle Times that I happened to keep. In Seattle, a group called S.O.M.E. for Save Our Moral Values mounted their campaign to repeal the ordinance. It was defeated with a sound margin. Notice the angry look on the face of one of SOME's proponents beside the celebration of gay rights activists. I remember a brochure from one gay rights organization saying, "Stop SOME before they become many." That same election day, California voters rejected Proposition 6, otherwise known as the Briggs Initiative. Prop. 6 would have singled out gay people to ban from teaching in the schools, among other things. Hopefully Referendum 71 can be added to the list of ballot box victories for human rights. Note added later. Referendum 71 passed in favor of preserving domestic partnership. I don't get why some want others to have less rights than others -what I do know is that the more educated people are the more tolerant they are of others! So education is definately the key. I hope Ref. 71 passes, looks like its building a little steam.